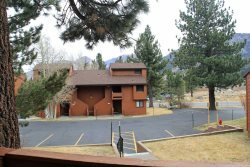 Nice One Bedroom & 1 Bath Condominium in town near the Sierra Star Golf Course and the shuttle route to the Eagle Lodge Express Ski Lift Area in Mammoth Lakes. Sleeps up to 4. Ground Floor unit. The Master Bedroom has 1 Queen Bed and there is a separate sleeping alcove between the entrance and the living room with 1 set of Twin Bunk Beds.There is also 1 Queen Sofa Bed in the Living Room. 2 TV's. Wifi Internet Access in the unit. You enter the unit from the ground floor and it is all one level. There are 2 outside parking spaces available. There is a game room with a billiard table, a ping pong table and a video game in the lobby of the Sunshine Village condos. In the summer you have access to BBQ areas throughout the complex and a Tennis Court near the swimming pool at Sunshine Village. Coin-operated laundry facilities located in the common area near the office. COMPLIMENTARY INTERNET and CABLE TV are provided, however NO REFUNDS will be given for connectivity problems or Internet failure. TOT LICENSE 3390-SV135. Check in and checkout process is super easy! Theres no need to rush to your apartment to make sure you get check in information from someone or anything like that. Theres an office where everything is set up for you to walk in and walk out without any hassle. They even give you a map when you get your keys to find your exact place! The space itself was well organized and very clean. The apartment is super cute! If youre slightly afraid of heights though, the top bunk bed is just slightly daunting without a rail. But I absolutely loved how the beds were designed and the quaint living space area with the couches and tv set up in front of the kitchen. The parking was simple enough as long as you read the signs. We only had 1 car, but I actually didnt immediately see a 2nd spot we were able to easily park at. If you have 2 cars, Id probably check on a bit more detail. Overall, this is a really cute spot for a group of 4 people, but definitely great for a small family to vacation in. Thank you. The photos were representative of the unit and it was very clean. Good location. The two bunks were perfect for the kids. This is a great family friendly place to stay. We were in walking distance of mammoth creek and the start of town loop where you can safely ride your bikes or scooters. The place is clean and comfortable. Our family enjoyed our stay and had a wonderful time. This location was perfect for us and it was just as you described in the ad. We would definitely visit again. The condo was very clean, comfortable, and in a very convenient location. Communication was seamless. Wed happily stay here again. Good place, as advertised. Comfy little condo at a convenient location. Served us well as home base for several days of skiing. Id definitely come back again. Good value, consistent with other comparable units in the area. Great cabin! Super close to Vons and the shuttles. Will definitely stay here again. Stay was great! Walking distance to Eagle Lodge. Perfect for a two day stay. Great location -- right next to the bus stop close to the Eagle Lodge. Were definitely planning to stay here again!